A few months ago, I wrote about the clever initiative of a Rhone Valley producer, Laurent Habrard, in Crozes-Hermitage, who created little bottles to send samples to his potential customers. The wines were then presented by videos on the web site by a sommelier and the samples could be purchased on line. The customers could request the samples for a few euros then deductible from the price of the purchased bottles. This clever initiative is now relayed in California by Crushpad. As you well know, I keep following since the beginning the progress and evolution of this innovative company. Crushpad just launched “Tiny Bottles” which is very similar to Laurent Habrard‘s process, but the American way. What’s the story behind “Tiny Bottles”? According to their new web site, most of today’s consumers refer to “influencers” to buy wine, either a wine critic, a friend or a site. Those influencers are giving advice on a wine they enjoyed or disliked, and are influencing our choices. Crushpad is now offering a new level of services: the possibility to watch videos about wines recommended by influencers and before buying, tasting some wines for sale in “Tiny Bottles”. As of today, there are two packs of Tiny Bottles, one of four Pinot Noir and one of four Cabernet Sauvignon available for $19 or $29. It’s always good news to see new services offered to consumers and this is one of great value. 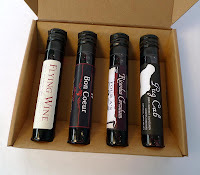 I just wished that the tasting of the wines included in the Tiny Bottles was made clearer among the many videos available on the site. I had to look around for little while but besides that “tiny” detail, the idea is fun and well implemented. Nice blog. I have never tasted Wines in "Tiny Bottles". Wish if I could experience it. Enjoyed your blog very much. These tubes are a great innovation from the WIT company. Several Sauternes producers, like Chateau Broustet, Chateau D'Arche, Chateau Rabaud Promis (first growth) have also choosen to launch a WIT. I guess it could really improve the consumption of these really sweet wines: You tend to never open a bottle, knowing you will not be able to finish it if you are only 2, 3 people or even alone. Does anybody know how long can last the wine in the tube ? Very interesting question. I just talked to Chateau Broustet in Sauternes-Barsac. Chateau Broustet uses the "tiny bottles" of WIT. They launched several "tiny bottles" of their wines: Sweet Broustet (NV) and Chateau Broustet (with vintage) in 10 cl bottle. The format existed for 2 years. For the Sauternes, they expect about 3 years of ageing potential. For their dry white, they think there will be only a 2-year ageing potential. Hope this helps. I'm currently working on a more in depth article on the subject. Previous post: Going green in the vineyards? Next post: Boomer Woman: the New Consumer?